Hubby loves to grill and he was very excited to try this out. This makes a great gift, what's more manly than making bacon? Has everything you need and clear instructions. Bought it for a friend who loves bacon. He loved it ! My son in law is a very innovative cook. He loved this gift. Good price,too. Easy curing and smoking instructions and what a great end product! Bacon was fantastic! We will definitely be making another batch! Bought this for my son as a gift - we just had the first of it tonight! Very easy to use. We don’t have a smoker, so we used the oven instructions and it was still great! I bought this for my husband as a Christmas gift. He loves bacon and I thought he would get a kick out of it. He cured it, smoked it, sliced it thin and then we packaged it up a few slices here and there and froze them so we could pull out bacon as needed! It was really good. He's asked if I could get it again so we could make some more bacon. I just might have too! I gifted this to my husband last Christmas and it was so easy to use and we've never had better bacon! I'll order this again! This was a great gift and I loved receiving it. Actually making your own bacon was fun. This is a great gift for anyone, who eats bacon and loves making things. Great for a chef in [email protected]! Received the kit and started curing a five pound slab of pork belly right away. A week later, two hours in my smoker and I had the best tasting bacon that my wife and I have ever had. I don't know what it would taste like if you dry it in the oven, but with the smoker it is great. I bought two more kits to get going on my next batch. For those of you that are wondering, once it's done curing and smoking a five pound pork belly ends up being about four pounds of bacon. Some things are best left to the pros. It turns out that bacon isn’t one of them. 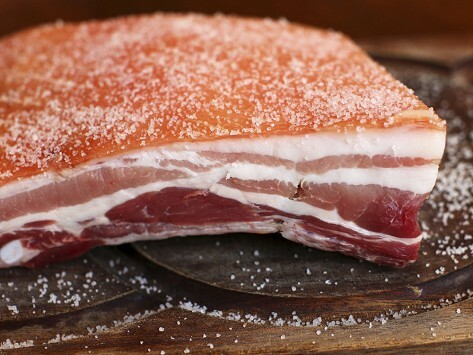 With The Original baconkit, curing your own bacon is easy, fun, and absolutely delicious. What began as a hobby for Russ Morgan and Todd Heckel became a business when their friends kept begging for more homemade bacon. In 2012, they turned their passion for pork bellies into a company called 7th West Charcuterie and The Original baconkit was born. It contains everything you need to make 5 lbs. of tasty homemade bacon except the pork belly itself (easy to find at your local supermarket or butcher shop).